It happened again! 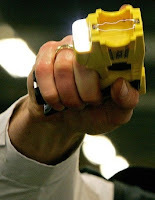 This time a 35-year old father who was trying to protect his children was electrocuted-to-death by the taser gun of an unidentified Springfield Township (OH) police officer. Four of his children were at the park with their father. Two of them, boys ages 15 and 16, were involved in the basketball game when their opponents attacked them. It will be weeks, possibly months, before the Hamilton County Coroner makes an official ruling on his cause of death. But relatives say they’re convinced the Taser shock must be to blame for the death of McGinnis, a healthy 35-year-old who exercised regularly. The police won't be able blame this one on drugs or 'excited delirium'. All - The family of Mr. McGinnis settled their lawsuit with the City of Cincinnati for $650,000.